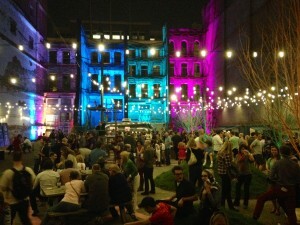 The city of Louisville and the Kentucky Distillers’ Association announced this morning that the popular “ReSurfaced” initiative, which transformed a vacant lot at 615 W. Main Street in downtown Louisville into a pop-up performance plaza and beer garden last October, will reopen next month with a bourbon and local food theme. ReSurfaced: The Bourbon Edition will open Thursday, June 4, coinciding with the opening of the second annual Kentucky Bourbon Affair, a sort of bourbon fantasy camp sponsored by the Kentucky Distillers’ Association. The KDA is a lead sponsor of ReSurfaced: The Bourbon Edition. Appropriately enough, the ReSurfaced location is along Louisville’s re-emerging “Whiskey Row,” which was the center of the bourbon world in the late 1880s. ReSurfaced, which will also feature music and art, will be open each Thursday, Friday and Saturday during June (except June 20, when a private event is planned). Mayor Greg Fischer said that people started asking when ReSurfaced would reopen soon after it closed last year. Partnering with the KDA during the Bourbon Affair “made an ideal pairing,” he said in a release, “like a fine bourbon and branch water.” The event will also serve as a preview for a major new bourbon and local food festival planned in Louisville in June 2016, he said. The new Bourbon Edition of the Resurfaced initiative is being curated by the effort’s founder, City Collaborative, a non-profit, community-based team that focuses on large-scale, high impact events. Would like more info please..